Want more information? Go Solo with Aim Sports Solo DL. These data loggers have all of the great features of their younger siblings. Plus, with an easy connection, they can read all of the data coming from your engine's ECU! Still want more? These units can be connected to AiM's SmartyCam (not included) for video to go with your data. Offered are kits for rides with stock ECUs and kits for racing with aftermarket ECUs. 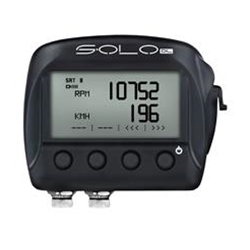 It's maximum information with minimal effort for you and your machine, thanks to AiM Solo DL data loggers!